Over the last 2 days, the SMA moved from 12 to 13. As new days are added, the old days will be subtracted and the moving average will continue to move over time. 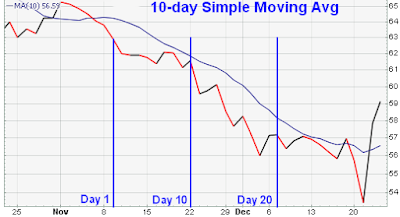 In this example , using closing prices , day 10 is the first day possible to calculate a 10-day simple moving average. As the calculation continues, the newest day is added and the oldest day is subtracted. The 10-day SMA for day 11 is calculated by adding the prices of day 2 through day 11 and dividing by 10. The averaging process then moves on to the next day where the 10-day SMA for day 12 is calculated by adding the prices of day 3 through day 12 and dividing by 10.The chart above is a plot that contains the data sequence in the table. The simple moving average begins on day 10 and continues. This simple illustration highlights the fact that all moving averages are lagging indicators and will always be “behind” the price. The price is trending down, but the simple moving average, which is based on the previous 10 days of data, remains above the price. If the price were rising, the SMA would most likely be below. Because moving averages are lagging indicators, they fit in the category of trend following indicators. When prices are trending, moving averages work well. However, when prices are not trending, moving averages can give misleading signals. Exponential Moving Averages can be specified in two ways – as a percent-based EMA or as a period-based EMA. A percent-based EMA has a percentage as its single parameter while a period-based EMA has a parameter that represents the duration of the EMA. For a percentage-based EMA, “Multiplier” is equal to the EMA’s specified percentage. For a period-based EMA, “Multiplier” is equal to 2 / (1 + N) where N is the specified number of periods. The 10-period simple moving average is used for the first calculation only. After that the previous period’s EMA is used.